All currencies in forex trading are quoted in pairs, one against another. Their names are given as a three letter abbreviation known as ISO code, where the first two letters represent the country and the third one is the name of the currency. Cross pairs comprise of two major currencies neither of which is the USD dollar, for example: EURGBP, EURCHF, EURJPY, GBPCAD, GBPAUD and CHFJPY. Exotic pairs consist of a major currency and another less traded one, for instance EURTRY, USDSEK, USDDKK, USDHDK, USDSDG. Exotics tend to be less liquid and to have less tight spreads. Currency rate always represents the value of the base (first) currency expressed in the quote (second) currency. In Forex there are two prices given - Bid and Ask- the former shows how much of the quote currency is required to sell 1 unit of the base currency and the later represents how much will be required to buy it. Ask price is higher than bid. The difference between two prices is referred as to spread, which is usually measured in pips or points. Previously, when only 4 digit precision was available, pip, or percentage in point, was the smallest unit to measure price fluctuations. With the introduction of more accurate 5 digit precision pricing the smallest unit of price change is called point, however 1 pip is still calculated by 4th digit. For example, if Bid price is 1.11443 and Ask price equals 1.11449, spread is 0.6 pips or 6 points. Sell or short positions are opened at bid and closed at ask. Opened at a predefined bid price, which is higher than the current one. 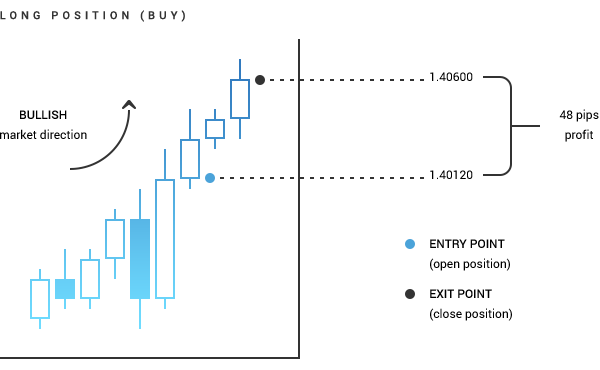 Closing order is always opposite to the opening one, that is, by closing a long (buy) position you sell the amount back and vise versa - when you close a short (sell) position, you buy the amount you previously sold. 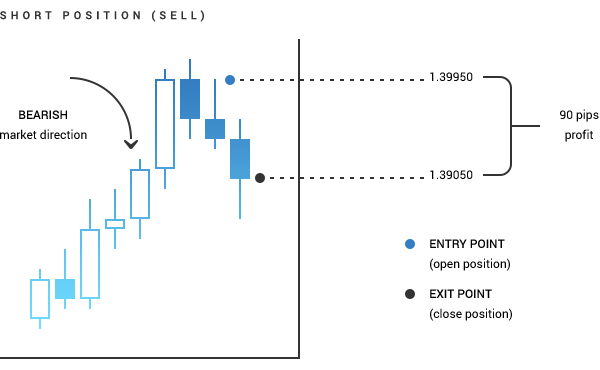 A position can either be closed manually at the current market rate or when a certain price level is reached, through Stop Loss and Take Profit orders. Stop loss is intended to limit the losses and is set above the open price for short positions and below the open price for long positions. Take profit allows you to close a position when a certain profit is gained. Take profit level is below current Ask price for a short position and above current Bid price for a long position. In order to gain profit you need to close long positions when the price goes up and close short position when the price goes down. To open a position you need to have a certain amount in your balance, which is commonly referred as to required margin or just margin. The amount depends on the trading tool, volume and leverage. Trading tool is basically anything you can trade with, including currency pairs, spot metals, oil or indices. Volume is the amount you buy or sell measured in lots. 1 standard lot equals 100 000 units of the base currency. Depending on your balance and account type you can also trade mini lots (0.1) and micro lots (0.01). Volume defines the pip price, that is, the higher your volume is, the more significant each price movement will be. For example, pip price for EURUSD 1 lot is 10 USD, for EURUSD 0.5 lot is 5 USD. You can use this tool to calculate pip price for any position. Leverage is a virtual credit provided by the company. The higher your leverage is, the lower marginal requirements will be. For example, when you use no leverage (ratio 1:1), you will need 100 000 EUR to open 1 lot of EURUSD; if your account leverage is 1:200, only 500 EUR will be required. The maximum leverage OctaFX offers is 1:500, that is, you will need only 200 EUR to open 1 lot. Required margin is always calculated automatically by the platform. To check how much approximately will be required to open a certain position, you can use our Forex Calculator. When you open a position, note that your balance remains intact. In fact, it only includes deposits, withdrawals and closed trades. The amount of required margin will be deducted from “Free margin” field, which also comprises of your floating profit or loss and deposit bonus if you claimed one. Free margin is the funds you can open positions with. Note that when you open a hedge order with the same volume, no margin will be required; however, if your free margin is negative, you will not be able to open an opposite position. If you margin level falls under 15%, your open positions will be mandatory closed starting with the trade that has the highest floating loss. Balance, equity, free margin and margin level are calculated automatically by the platform and available anytime in the “Trade tab”. Basically, all you need to do to start trading forex is to open an account and download and install trading platform or sign in to the MT4 or cTrader web based terminal. If you have any questions regarding the market, OctaFX website or trading conditions you can check our elaborate and comprehensive FAQ. Whenever you encounter an unfamiliar term, word or market phenomena, you can check its definition and description in the Forex Glossary. Our award-winning Customer Service is always glad to answer any questions you have and is available 24/5.